We have already published several tutorials about creating end credits. Probably, one of the oldest is the tutorial "Closing Credits - "Star Wars"" because it was already on the old Declic-Video site. That tutorial used the 3rd party plugin JPs Effects . Then came the video tutorial "Tip-4 Closing Credits (#182)" and the "Using the HFX effect 312-finale." tutorial which used Hollywood FX. Then with Pinnacle Studio Ultimate (V14 or higher), it was the Motion titles highlighted by the tutorial "Overview of Motion Title" that were used to make "Closing Credits Using Only Pinnacle Studio" and see how Pinnacle Studio was able to do this task on it's own. Finally it was Avid Studio's turn (or new Studio versions) that did all the work to make a new kind of end credit in "Studio can Create End Credits on It's Own". Today, with Studio 16 or Studio 17, we will try to do almost the same thing, using titles and effects from the Ultimate version. The first 70 seconds of the "The-Sky-is-the-Limit" sample film. 6 snapshots captured from this sample film. 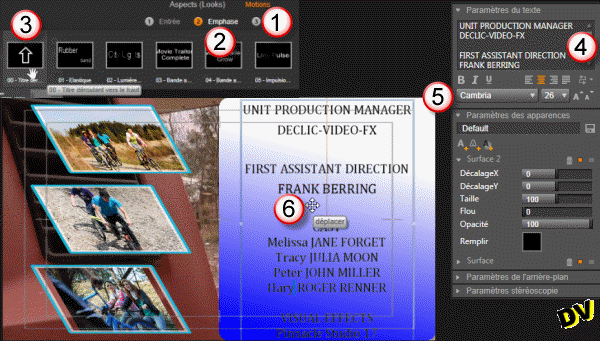 Screen capture was discussed in the "Customize "Movie" transition provided with Studio" tutorial. You will see the snapshots in two stages. The first 3 display almost immediately at the beginning of the credits and will be replaced by the following 3, just before the start of the motion title. Place the first 70 seconds of the sample film on A/V Track(2). Put the first snapshot on the A/V Track (1) at the 5 second mark and lengthen the duration to 30 seconds. Add a 2 second long fade at the beginning of the snapshot. By double-clicking on the first snapshot, you will access the Effects Editor. Select the 1 2D-3D tab and then the "3D Editor CPU" effect. Select the "No Preset" preset option to reset all settings. Then use the "3D Editor CPU" settings shown in the screenshot at the right. You can tweak the position, size, and shear if needed. Set the Inner and Outer Border as shown. Save your effect and its parameters as vignette1 i.e. When you return to the main interface of Studio, you will see that the snapshot is marked by a magenta effect indicator and the settings have been applied. Put the second snapshot on the timeline at the 10 second mark and lengthen its duration to 25 seconds. By double-clicking on the second snapshot, you will go to the Effects Editor. Apply your "vignette1" effect saved in "My FX Compositions". You only have to change the Position Y setting to (Y = 0) as shown in the screenshot to the right. Save your effect and its parameters as Vignette2 for example. Put the third snapshot on the timeline at the 15 second mark and lengthen its duration to 20 seconds. By double-clicking on the third snapshot, you will go to the Effects Editor. You only have to change the Position Y setting to (Y = -33) as shown in the screenshot to the right. Save your effect and its parameters as Vignette3 for example. Place the last three snapshots on the timeline as shown in the screenshot to the right and lengthen the duration to 30 seconds for each. On the fourth snapshot apply the "vignette1" effect saved in "My FX Compositions". On the fifth snapshot apply the "vignette2" effect saved in "My FX Compositions". On the sixth snapshot apply the "vignette3" effect saved in "My FX Compositions". As you can see from the first screenshot, the credits are shown against a colorful blue/white gradient background. This is the backdrop you will now create and animate. 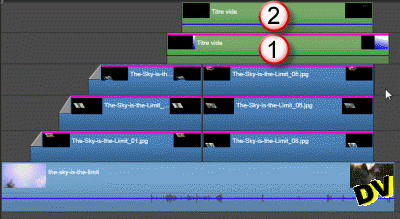 Make the track above third thumbnail the active track, place your cursor between 28 and 30 seconds from the beginning of the timeline and create a blank title. Go into the Title Editor. Since you don't need to see the other tracks, make sure the "Solo" mode is enabled (Word "Solo" orange). Completely delete the predefined text (Your Text Here). Left click in the Background Drop Zone to gain access to the background color. Open Background Settings if needed. - Select the left marker under the gradient color bar and set the R and G cursors to 0, and leave the B cursor at 255 (blue). 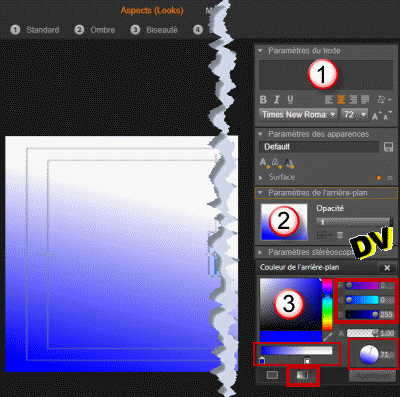 - Select the right marker under the gradient color bar and set all sliders to 255 (white). - Move the right marker closer to the center to have a clearer gradient. - Rotate the gradient colors using the wheel or enter an angle directly. The empty title shows the gradient you just applied. Right-click the title and adjust its duration to 39 seconds. Your-background screen- title reflects the gradient and its duration has been set to 39 seconds. All that remains is to animate it. Right-click on the title to open the Effects Editor. In the Effects Editor, apply the "2D Editor Advanced" effect with the "No Preset" option. Set Horizontal to 100 (not visible in the preview window). Activate keyframes (diamond turns orange). The first keyframe is created automatically. - Create a second keyframe at 3 seconds with Horizontal = 50. - Create a third keyframe at 36 seconds with Horizontal = 50. - Create the fourth keyframe at the end of the effect with Horizontal = 103. Motion applied to the background is visible on the timeline. Select the first track above the background and place your cursor at 32 seconds from the beginning of the timeline to create an empty title that will contain the text for the rolling title. In the Title Editor, select the "Motions" tab. Select the 00-Roll Up motion. Delete the predefined default text and enter the text of your choice using the various settings available. At this stage, it is regrettable that the text alignment buttons can't be applied to just the selected text, the alignment settings must be applied to the entire text. Finally, the inability to use the tab will make it hard to achieve the best layout. I have used Boris Graffiti to make these scrolling credits because the Studio titles are a little too basic for my taste. You can select all or part of your text to apply a style, font, or size. Place your cursor at the center of the title. When the cursor turns into a crosshair, you can drag the text by holding down the left mouse button in order to center it on the blue background ("Solo" button out of service).